Houston had a passion for playing soccer beginning at the age of 4 years old. He was a member of the Wellington Soccer Club for 8 years. He was a four year varsity soccer starter at Palm Beach Central HS. He was a two year starter on the Men’s Varsity Soccer Team at Northwood University. Houston demonstrated great respect and loyalty to the club, his teammates, opponents and all coaches. His work ethic was second to none. He always left everything he had on the soccer field. He was a leader and his teammates looked up to him during good and bad times. He gave back to the Wellington Soccer Club during his playing days by assisting Coach Patrick and Coach Edner working spring and summer camps and clinics. He worked the concession stand with his teammates who needed to raise money to pay their registration dues. Once a year, the Wellington Soccer Club Houston Lillo Scholarship committee identifies candidates who best represent the qualities and characteristics demonstrated by Houston and awards them with a scholarship to help pay for their annual registration fees. What is the most difficult obstacle you have faced? What resources did you marshal to confront it? How did the experience affect you and/or transform your life? During my senior year of college, my spring break was interrupted by a tragedy - one of my childhood best friends had been killed in motorcycle accident. Houston and I had played soccer together from ages 9 -18 (before we went off the college) and had been co-captains of our club team for most of those years as well. The news was very hard on me - I really grew up with Houston. As if seeing each other 3 -4 times a week for soccer wasn’t enough, Houston and I also regularly hung out, had sleepovers, and pretty much did everything else kids/teenagers could do together. Throughout my life, I had always used soccer and working out as an escape for all my problems. It helped me relieve stress and allowed me to get my mind off of whatever was plaguing me at the moment. With Houston’s passing, however, I was unable to use my usual outlet because of how much it reminded me of Houston. Houston and I had spent too many hours playing soccer and pushing each other through workouts that my normal release was of no use to me. I spent a lot of time reflecting on all of my memories with Houston as well as recounting many of them to friends and family. I sought advice from friends who had been through similar experiences, which helped to some degree but I think the biggest step in coming to terms with what happened was going to Houston’s funeral and seeing all of our old teammates and coaches. I was able to say goodbye to Houston and reflect with others on all the fond memories we had together. I don’t think I ever truly got “over” Houston’s death, but I have certainly learned to live with it. I may not be able to see or talk to Houston any more, but I will still always have the memories of all the times we spent together. After saying farewell to Houston, I vowed to keep in better touch with any old friends and to truly appreciate not only each of my friends and family members but also each day I get to spend with them. I find myself much more expressive than I ever was before - I want my friends and family to know how amazing they are and how happy I am that they are in my life. Houston was never shy to give out a compliment and I always admired that about him. I think in his passing I took up that trait and hope to carry it with me for the rest of my life. 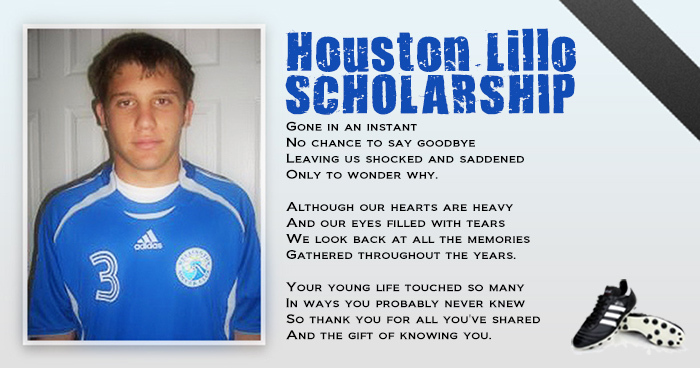 If you would like to donate to the Houston Lillo Scholarship Fund, click here.